Can Taking Vitamin D Make You Gain Weight? You need vitamin D to help absorb calcium and keep your bones healthy, but it also plays other roles in the body, including promoting immune function, cardiovascular health and limiting inflammation. It appears that vitamin D isn't likely to cause weight gain because people who are overweight often have low levels of this nutrient, not high levels. Check with your doctor before taking a vitamin D supplement to make sure it's safe for you. According to research, obesity may be associated with low levels of vitamin D. People with higher BMIs -- which indicates higher body fat -- tend to have lower levels of vitamin D in their blood, according to a study published in the European Journal of Nutrition in 2008. Low vitamin D levels are associated with an increased risk for both type 2 diabetes and obesity, according to research published in Aging in 2013. Young adults with low levels of vitamin D are more likely to have higher levels of body fat and be shorter in height than young adults who have sufficient amounts of vitamin D in their bodies, notes a study published in the Journal of Clinical Endocrinology and Metabolism in 2008. These study results suggest that taking vitamin D supplements will is in fact not linked to weight gain. Getting more vitamin D might actually help limit weight gain in children who have an obesity-associated gene, because vitamin-D deficient children are more likely to have higher BMIs and gain weight, notes a study published in Diabetes in 2014. Vitamin D levels may affect the onset of obesity by limiting weight gain due to a diet high in fat, although the exact mechanisms for the limitation aren't clear, according to an animal study published in the Journal of Nutritional Biochemistry in 2014. The study authors note that vitamin D appears to help increase fat metabolism, which may be partly responsible for the beneficial effects of vitamin D in limiting weight gain. Further research is necessary to verify whether or not these effects occur in human subjects. At least one study shows vitamin D may cause weight gain -- but only in a very specific group. Asian women living in London who took supplemental vitamin D during pregnancy showed improved nutritional status and enhanced weight gain leading to fewer low-birth-weight infants compared to similar women who didn't take vitamin D supplements, in a classic study published in the British Journal of Obstetrics and Gynaecology. These results only apply to vitamin D use and weight gain in pregnant Asian women and their infants, though, and cannot be used to make generalizations about weight gain in the general population. Although vitamin D may be associated with limiting weight gain, it doesn't necessarily aid in weight loss. Even though low levels of vitamin D may be associated with obesity, taking vitamin D supplements for three months doesn't help people lose weight, according to a study published in Nutrition & Diabetes in 2015. When study subjects took vitamin D, it didn't significantly affect their BMI values, even at amounts of up to 4,000 International Units per day, which is the tolerable upper intake level set by the Institute of Medicine. Adults up to 70 years old, including women who are pregnant or breastfeeding, need at least 600 International Units of vitamin D per day. Adults older than 70 should get at least 800 International Units. Intake is important because not getting enough vitamin D can lead to weak bones and muscles. People who don't get enough vitamin D from food or who are at higher risk for vitamin D insufficiency -- such as older individuals and those with health conditions that limit vitamin absorption -- can take vitamin D supplements to help meet their daily needs. Of the two forms of vitamin D available in supplement form, vitamin D3 is about 87 percent more potent in people and is often less expensive than vitamin D2, making it the better choice, according to a study published in The Journal of Clinical Endocrinology and Metabolism in 2010. You can get some vitamin D simply by spending time in the sun without sunscreen, although during certain seasons, or if the day is smoggy or cloudy, it may not be possible to get all of your vitamin D this way. When substances in your skin are exposed to the proper wavelength of ultraviolet radiation from the sun, your body can convert them into vitamin D. Spending between 5 and 30 minutes in the sun with your face, back, legs or arms exposed and not covered with sunscreen at least twice a week between the hours of 10 a.m. and 3 p.m. may be enough to meet your vitamin D needs, according to the Office of Dietary Supplements. You can get vitamin D from food, too. For example, a 3-ounce serving of salmon has about 556 International Units of vitamin D, a cup of fortified orange juice provides about 137 International Units and a large egg has about 41 International Units, all of which are found in the yolk. 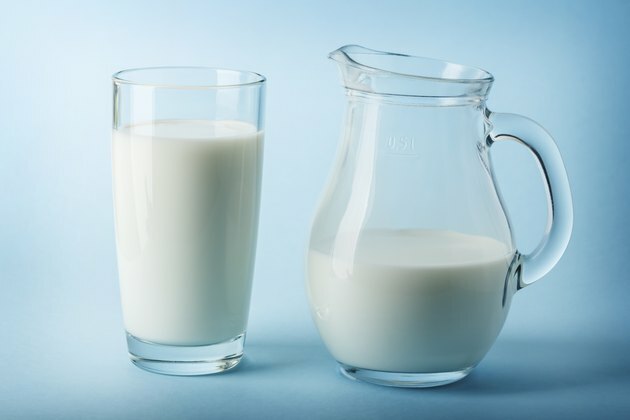 A cup of nonfat fortified milk can have up to 124 International Units of vitamin D, and a serving of fortified cereal may have 40 international units or more of vitamin D. Tuna, fortified dairy products, liver, sardines and cheese all provide dietary vitamin D as well.